We get them, before they get you! Wasps are stinging insects closely related to both bees and ants.There are solitary and social wasps. Solitary wasps are all fertile and each build nests of single eggs. Typically these are non-aggressive. Social wasps such as hornets and yellow jackets consist of a queen and workers. Nests vary by species and location and many make paper nests in trees, eaves, attics, wall voids, crawlspaces, and ground holes. 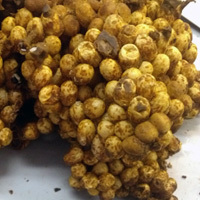 Some species have nests of small numbers while others can be home to 500 to 1000 wasps. 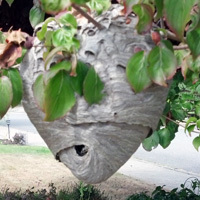 The original queen and colony workers die off late in the fall and new queens produced by the nest hibernate over the winter. These queens will produce new nests next year. Old nests will not be reinhabited. Unlike wasps, bees are not predators. They feed on nectar and pollen, and can also be solitary or social. Common bees are honey bees and bumble bees. Honey bees typically live in hollow areas such as holes and voids and produce honey combs and honey. They live year round, but hibernate in the winter. 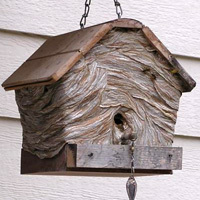 Colonies are established by swarms consisting of a newly mated queen and a portion of the original colonies workers. This group moves together in a swarm to a new nestings location. 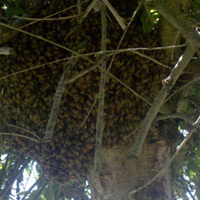 On their journey they may be observed flying in a swarm, or in a tree or bush, in a ball of bees. 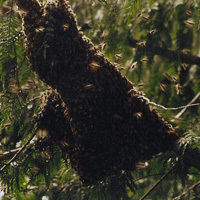 Often a beekeeper will be interested in collection a swarm prior to established nesting. "Thank you! Aaron has done an outstanding job. What an asset to you." Written by: Sally, Camano Island, WA. © 2007 - 2019. All Rights Reserved. Created and Maintained by bWyse Internet Marketing, Redmond WA.